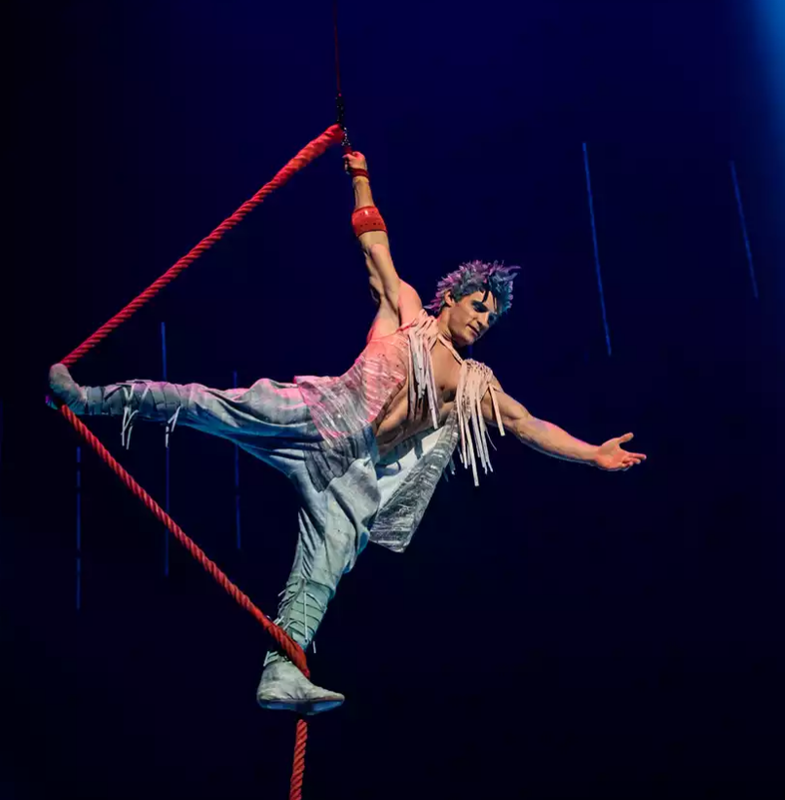 Cirque du Soleil, a French-Canadian invention, has a story to tell—it’s about brotherly love, giving a hand to others, and cooperating, rather than competing. It’s a parable about tortured Waz (talented Joey Arrigo), a young man who feels alienated from the Grey Ones, who march in unison, heads-down, looking at their hypnotic cell phones. Waz’s story traces his re-connecting with friends who help him and bring him to new heights of dancing and flying with their dynamic, death-defying stunts. The guys and gals reject jealous competition and glorified isolation. In its place, they celebrate each other—with lots of hand-slaps, smiles, and pounding music. And he is revived by their generosity. 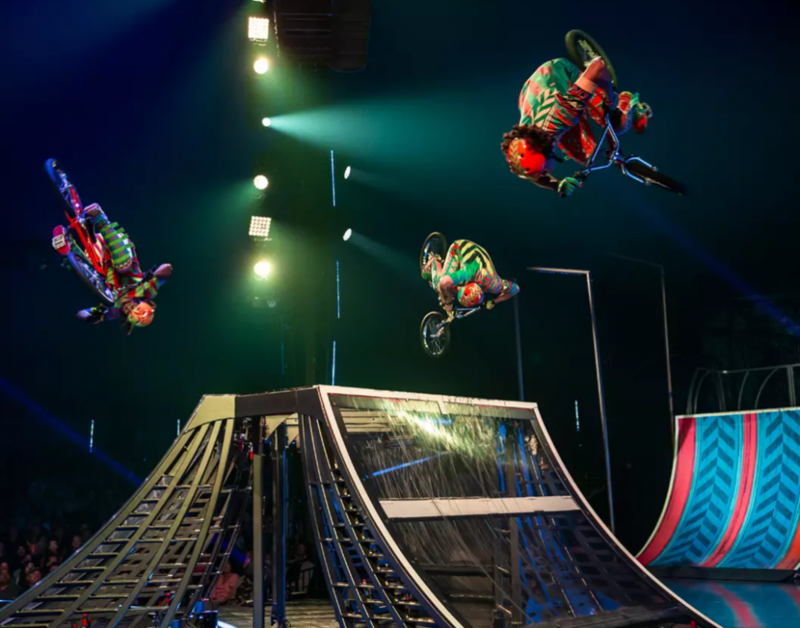 These guys do extreme sports–on bikes, on hoops, on lighting fixtures—parkour as a path back to oneness with other folks—to feelings of brotherhood, rather than antagonistic competition. Perhaps the famous Liberté, Egalité, Fraternité at work? 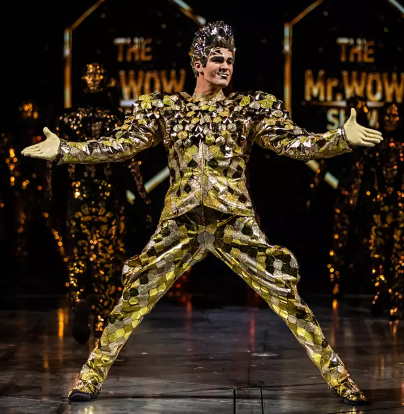 There’s the Mr. WOW show, featuring a man in a Golden Leaved Suit with a broad artificial grin. He presides over a kind of Hunger Games or a Reality Show—that shows the TV side of culture. Then there’s the fabulous, muscular Quebecois Philippe Bélanger on the unicycle. Philippe balances lovely Marie-Lee Guilbert, hand-to-hand, lofting her into the air—while pedaling the unicycle! Amazing–and smiling, too! We all gawk at the Guardian Angel in the City, as hangs from a huge Acrobat Lamp, high in the rafters of the enormous tent. His agility and grace reflect the future grace of our wandering Waz. The Angel dances and contorts as the lamp whizzes up to great heights. Heart-stopping! Amazing feats of balance and co-ordinated flying moves await you in “Rise and Shine,” with all the guys and gals flying, leaping off of a house-sized Tramp-Wall onto giant trampolines in groups and teams that look they must collide. Instead, they whiz by each other in perfectly co-ordinated aerial gymnastics. Their timing is split-second–breath-taking, and clearly having a ball! In Act Two, there’s amazing British Atherton Brothers, Andrew and Kevin, perform “Cause You’re Still Here,” as the two perfectly-muscled young blond twins, on Duo Straps swing high through the air. The Athertons intertwine themselves—becoming one and two and one, again. They reflect each other’s moods and tricks, they separate, they fly–up, down, everywhere. Mirror images of brotherly feeling fly far above our heads. Heart-stopping. In “Urban Jungle,” astounding Dina Sok, Cambodia, and his gang Jump through Hoops, spectacularly. Lots of gymnasts shoot themselves through big and small diamond shaped hoops, piled high. They contort and fling themselves like arrows right through those hoops. An elaborate and thrilling maneuver. Don’t miss Danila Bim of Brazil who dances like an angel—as she rises into the air by her HAIR! She is perfectly placid and graceful as she swings, pirouettes, and dances help aloft by her hair. Lovely, lyrical, allegorical, too. When the transparent ramps are rolled out and all the fly by in coordinated risky stunts on their colorful BMX bicycles, Waz has been embraced by their brotherhood. He’s no longer alone. Fraternité has returned. 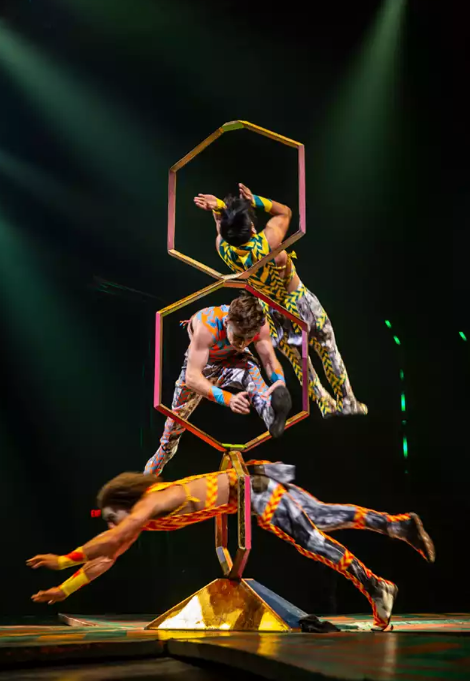 Cirque du Soleil earns its reputation, with spectacular flying, wonderful music, and graceful dance on bikes, hoops, and aerial straps. 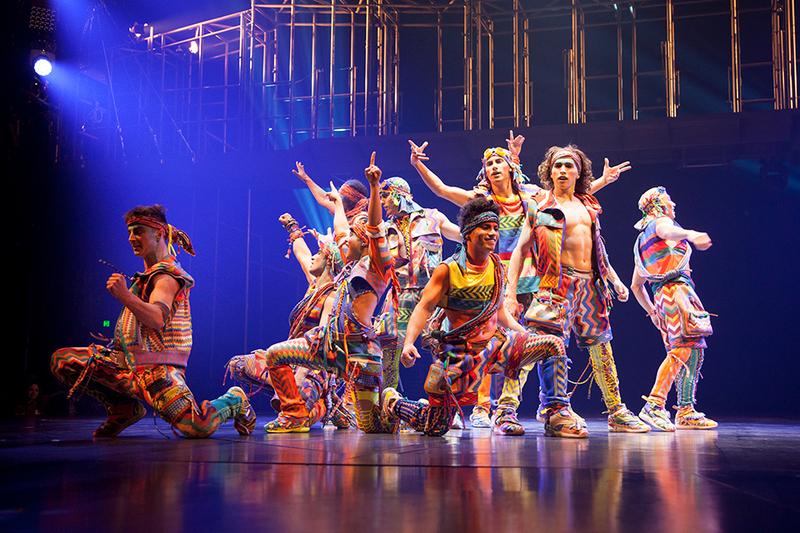 Cirque feels welcoming to all in the Big Tent.